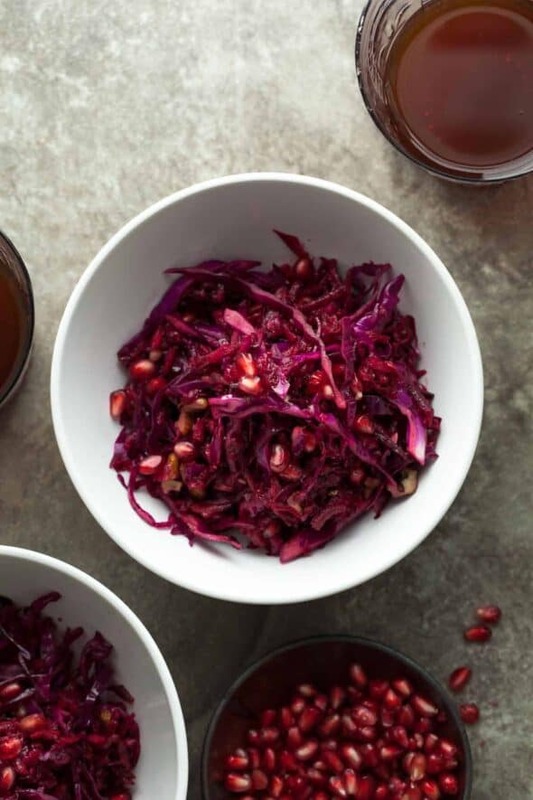 A festive red slaw filled with the bold colors and flavors of beets, carrots, red cabbage and pomegranate. The holidays are fast approaching, and pretty soon we’ll be in the thick of it. 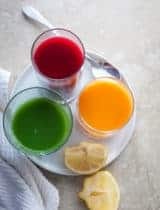 Between the family gatherings and holiday parties, or the extravagant meals and cookie making, it’s easy to get overwhelmed (not to mention overfed) this time of year. 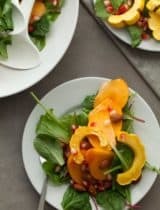 So what I have for you here is a little respite from the upcoming madness, it’s a simple little salad that will dress up your holiday table but is easy to throw together and can be made ahead of time. It’s a festive shade of red that’s a feast for the eyes and makes a nice counterpoint to the rather rich holiday fare. Crunchy and bright, it’s bold in both color and flavor. 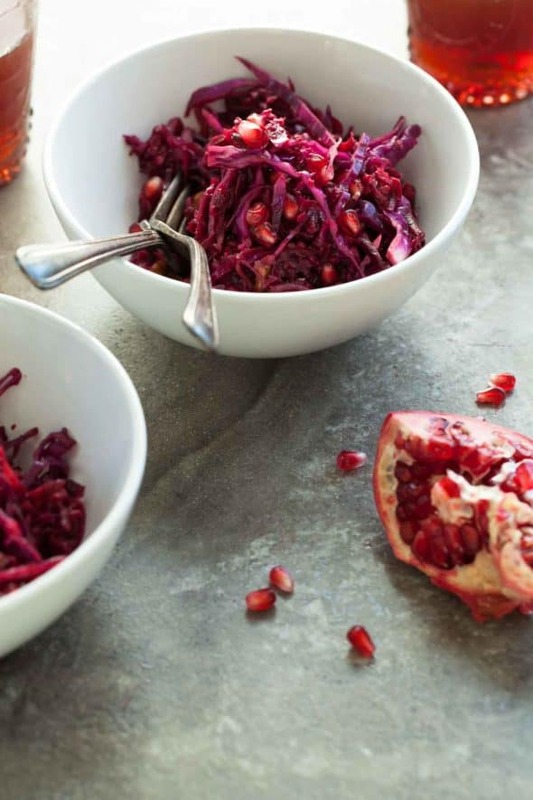 Red is the theme for this slaw which is filled with red beets, red cabbage, red (ok purple) carrots, red apples, red pomegranate seeds…well you get the idea. First you start by shredding all those lovely vegetables. You can use a grater or take the easy route and pop the shredding disk onto your food processor. 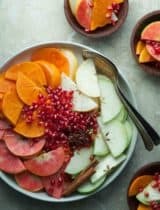 Once you’ve turned all those hard vegetables into tender shreds you throw in some julienned apples for sweetness and toss everything with a lip-smacking pomegranate dressing. 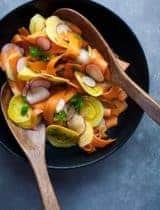 The sweet-tart dressing is just the thing for the colorful mix of carrots, beets, cabbage and apples, a perfect balancing act of earthy, sweet and tangy in every bite. A handful of pomegranate seeds strewn on top add a little bit of extra glitter and glam to the already festive salad. 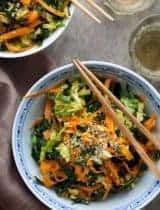 I like to make the salad ahead of time so that the vegetables marinate a bit in the dressing and have a chance to soften and soak up all the wonderful flavors. If you make it the night before, just hold off on the apples until you’re ready to serve to preserve their crunch. In a large bowl whisk together the pomegranate molasses, balsamic vinegar, olive oil, honey, salt and pepper until well combined. Grate the beets, carrots, cabbage in a food processor using the shredding blade. Combine the grated beets, carrots and cabbage with the dressing and toss well to coat. Let the salad stand for at least 15-20 minutes before serving or make ahead and store covered in the fridge until ready to serve. When ready to serve add in apple, tossing gently to combine and top with pomegranate seeds and chopped walnuts. 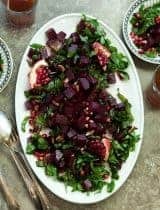 Love the idea of this, but I am not ordering pomegranate molasses just for this salad. (Never saw it in any stores near me) What can I substitute for it ?? Thanks in advance. 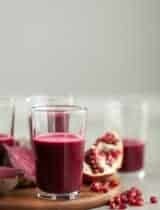 You can make your own by reducing pomegranate juice down to a syrup instead. Or I might mix pomegranate juice with the balsamic vinegar and reducing that slowly over the stove until it's syrupy. I am already planning how to get it all done for Thanksgiving. 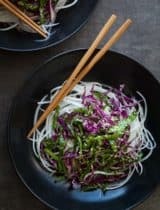 I am loving all the flavors in this slaw, and I have quite a few beet lovers that will be coming so I think this needs to make it on my menu! I love the colors in this slaw! So festive! Definitely adding this to our Thanksgiving menu! This looks so good, I need to try it! Slaw is definitely something I need more of in my life! Such a pretty color! Your pictures are great! Also this would go great with many different types of parties! Love the dash of sweetness! This sounds DELICIOUS! Definitely trying this recipe! Such yummy flavors all put together, thanks! This is beautiful! 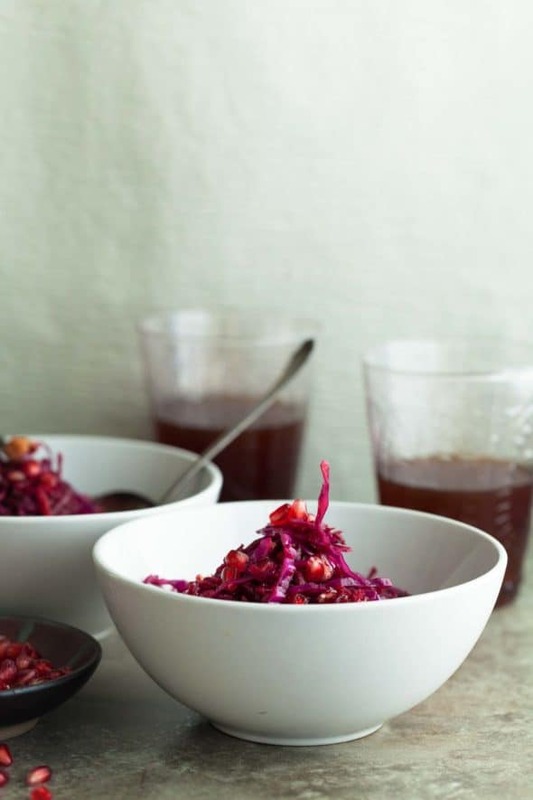 LOVE beets, such a great idea in this slaw! Who wouldn't grab that at a holiday gathering?! It's so festive, beautiful and delicious-looking! This looks beautiful, Sylvie! I'm going to bookmark it to hopefully try over Thanksgiving with my sister. I know we'd both appreciate some fresh veggies in between all the feast foods.